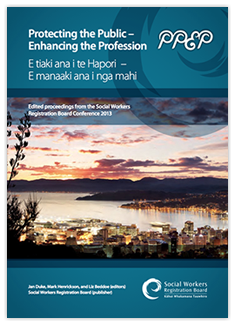 To celebrate the 10th anniversary of the implementation of the Social Workers Registration Act 2003, the Social Workers Registration Board of Aotearoa/New Zealand hosted a conference held in Wellington on 11–12 November 2013 at the Museum of New Zealand Te Papa Tongarewa. The conference was an opportunity to create a vision for social work and the social service sector from academic, practitioner and regulatory perspectives. We have made PDF and EPub formats available free of charge, and a print version availalbe for purchase below. ** Epubs can be downloaded and then opened by an ePub reader, either on your computer or mobile/tablet. Click here for more information on how to use these.